Internet Genealogy is indeed a brave new world! 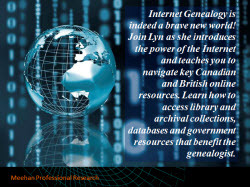 Join Lyn as she introduces the power of the Internet and teaches you to navigate key Canadian and British online resources. Learn how to access library and archival collections, databases, and government resources that could benefit the genealogist.